It was the end of the road for Mohammed Opeyemi, who owned an internet cafe on the premises of Kwara State Polytechnic in Ilorin, Kwara State. Opeyemi, who was arrested by the security personnel of the institution, had for a long time been allegedly forging fees clearance documents for the graduating students of the school. Narrating how the culprit was apprehended on Wednesday, the Rector of Kwarapoly, Alhaji Mas’ud Elelu, said the suspect was caught with a stamp and signature specimen of the approving officer of the audit department of the institution. Elelu, who is also the Chairman, Council of Heads of Polytechnics and Colleges of Technology in Nigeria, described the action of the suspect as an economic sabotage and a dent to the image of the poly. According to him, Opeyemi was later handed over to the police for interrogation and possible prosecution. He added that after investigation, any student or staff that is an accomplice of the culprit would be punished. Elelu said, “We caught him through our intelligent network. We caught him with some of the stamps and documents he had forged. He had stamps of the audit department and even the signature of the man in audit that normally signs the document. “That audit paper is always presented before certificates are signed. The procedure is that at the end of payment by graduating students, there is verification, after which the audit department will certify. It is the paper from audit that is attached to the application sent to Exams and Records and then the calligrapher will now write the certificate and send it to the Registrar; then it will come to me as the final person that will sign. 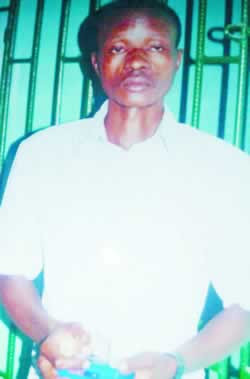 Elelu said Opeyemi’s cafe had been shut down and that investigations were on to arrest his accomplices. “The certificates that have been signed or to be signed by him have been stopped,” he added. The Kwara State Police Public Relations Officer, ASP Ajayi Jeffrey, said the police was committed to arresting fraudsters, including those who engage in forgery. He added that after investigations, the police would ensure that the culprit was prosecuted. He urged people to desist from any criminal indulgence, adding that the law would catch up with people of questionable character in the state.